I finally went to Amazon.com yesterday and skimmed through the book Grain Brain. The author, Dr. Perlmutter, is an award-winning, practicing neurologist. The book was a number one New York Times bestseller. Perhaps he has something to say. With “grain” in the title, I assumed the book was about avoiding gluten, a protein found in some grains. 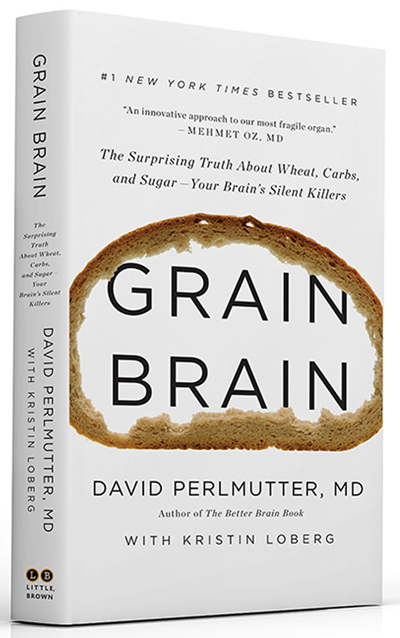 Was Perlmutter going to argue that gluten impacts neurological function? The full title, which I just saw now, is telling me it isn’t about gluten, not exclusively. It’s about carbohydrate. So, is he arguing that dietary carbohydrate impacts neurological function? Any food with carbohydrate in it? Quinoa? Rice? Beans? Apples? Carrots? Lemons? Potatoes? Just about all plant foods contain carbohydrate. Modern grains are silently destroying your brain. … I’m referring to all the grains that so many of us have embraced as being healthful – whole wheat, whole grain, multigrain, seven-grain, live grain, stone-ground, and so on. I will demonstrate how fruit and other carbohydrates could be health hazards. … An extremely low-carbohydrate but high-fat diet is ideal (we’re talking no more than 60 grams of carbs a day – the amount in a serving of fruit). This may also sound preposterous, but I’ll be recommending that you start swapping out your daily bread with butter and eggs. You’ll soon be consuming more saturated fat and cholesterol and re-thinking the aisles in your grocery store. In the days leading up to your new way of eating, you’ll want to take an inventory of your kitchen and eliminate items that you’ll no longer be consuming. Start by removing the following … All forms of processed carbs, sugar and starch: corn, yams, potatoes, sweet potatoes. – Whole sweet fruit: Berries are best; be extra cautious of sugary fruits such as apricots, mangoes, melons, papaya, prunes, and pineapple. I’m going to rescue you from a lifetime of trying to avoid eating fat and cholesterol and prove how these delicious ingredients preserve the highest functioning of your brain. … Our bodies thrive when given “good fats,” and cholesterol is one of these. And we don’t do so well with copious amounts of carbohydrates, even if those carbs are gluten-free, whole grain, and high in fiber. Maybe we’re all a little guilty of focusing on science that supports our preconceptions and glossing over that which challenges them. It’s our prerogative. Most of us aren’t writing books, selling products, and collecting consulting fees. Don’t you think that someone who is presenting himself as an authority, who claims to be science-based, who is urging millions of people to adopt a controversial diet, would be more even-handed with the evidence? I do. The reason I support eating a whole-food, plant-based diet is because I’ve read the studies, not because I’ve read a book by someone claiming to have read the studies for me. 1 This particular claim has been exhaustively researched by a blogger who goes by Plant Positive. He refers to people who reject the lipid hypothesis, as Perlmutter does here, as cholesterol deniers. He’s amassed a trove of evidence that defends the lipid hypothesis, that defends the correlation between serum cholesterol and heart disease, i.e. the lower your cholesterol, the lower your heart disease risk. This entry was posted in Diets, Gluten, Grains, High-Fat Diet, Low-Carb, Meat-Rich, Mental Health, Paleo Diet, Plant-Based Diets on July 21, 2014 by Bix.